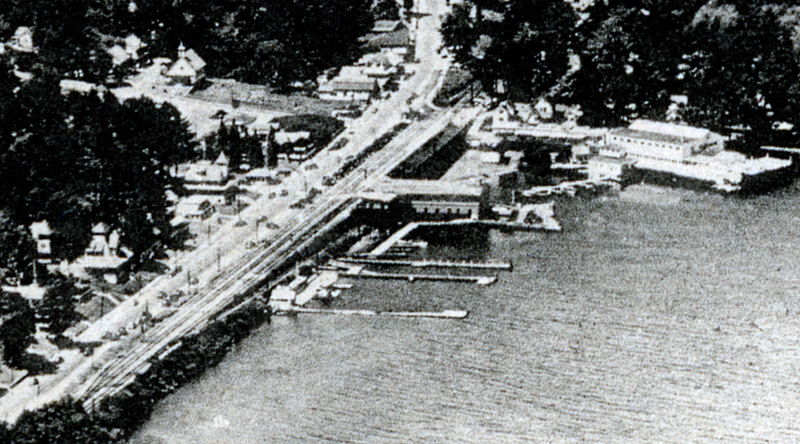 Weirs Beach in 1938 or 1939. The lower left corner of this photo shows the junction where two railroad sidings diverged west of the main line, while a spur diverged east along the waterfront and down a slope to a freight house underneath the railroad station. Fronting Lakeside Avenue, in the middle and on one corner of the block where the New Hotel Weirs had stood, the Half Moon Tea Room restaurant and Korner Kubbard general store make their first aerial photographic appearance.